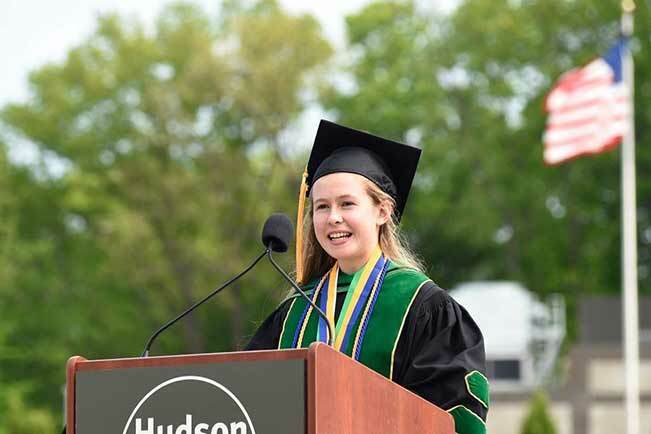 Hudson Valley Community College pushed Grace Harrison out of her comfort zone, but she'll tell you that's a good thing. "I don't think I would have taken advantage of half the things I have, if I hadn't had the experience I did at Hudson Valley," the 2018 Cornell University graduate said. "For some people, the community college experience is a stepping stone for better things. To me, it was a milestone." Grace was just 16 years old when she arrived at Hudson Valley after spending the previous year at a Rudolf Steiner school in Switzerland. She said she was looking for a way to continue her education and prepare for transfer into a four-year program, although she wasn't exactly sure about her ultimate course of study. Hudson Valley was the right fit. "I remember meeting with the admissions director. She planted the idea that I could get to Cornell from here." Although one of the youngest full-time students when she began, Grace jumped into campus life, successfully running for Student Senate and becoming its president and the college's student trustee during her senior year. If Grace was looking for a way to build self-confidence and time management skills, she chose the right extracurricular activities. As senate president, she helped plan and coordinate dozens of student events, ran senate meetings, oversaw a $900,000 budget and even addressed the college's combined faculty and staff at the All College Meeting and her fellow graduates at Commencement. "One of the great things about Hudson Valley is that it's a really diverse group of students. In many ways, it prepares you for the different kinds of people you meet in life," she said. "I really liked how Hudson Valley was small enough that you could build a relationship with your professors, but big enough so that there were a lot of opportunities to get involved." At Cornell, Grace continued her involvement in campus life, joining the NCAA Division I women's sailing team as a walk-on and working on several student advisory councils. She says she did a lot of growing up at Hudson Valley. The lessons she learned here served her well at Cornell's College of Agriculture and Life Sciences, where this spring she will earn her bachelor's degree in Applied Economics and Management.